The United Nations (UN) try to be present all over the world and try to response quickly in case of an emergency. However, local aid workers are subject to multiple attacks. Acting in insecure areas could mean for the NGOs (Non-Governmental Organization) huge expenses in security management. Thereby more of them prefer to use remote management to secure their international staff in a secure place. However, the remote control or remote management can lead to risk transfer to local teams, wrong accountability or monitoring. Generally, those effects are due to a bad planning. In addition, remote control is implemented in emergency situation. Though, if it’s executed and correctly planned in the early stages of the project it could really help the NGOs to still provide aid to highly insecure areas. To avoid a lack of coordination they have implemented some years ago a cluster approach (figure 1 shows the UN clusters). The system is composed by a team leader who will coordinate the actions and sectoral teams for each activity. Some notable benefits have been demonstrated through the years as better coordination, less gap and a better information sharing between the members. The theory behind this cluster approach is based on a cluster management cycle used also in knowledge cluster (academic and companies). This perpetual cycle is composed by six stages: Define, Design, Implement, Monitor, Evaluate and Revise. It gives a framework and recommendations to correctly implement the cluster approach on remote project for example. It highlights the fact that this approach and remote project should be think early before the project otherwise the benefits and objectives could not be reached. Finally, clusters are a new way to work together. It promotes innovation and is a unit with its own agenda inside a company. As it will be explained in this article, the lessons and challenges from the emergency response could be transposed to companies doing remote project. There are multiples difficulties to implement this kind of project as the difference in time zones, languages, and technologies. Moreover, there should be a mutual trust to accomplish the specified task between the members. In brief, this article starts from the case of emergency situations and NGOs, shows an approach to correct certain difficulties in the collaboration process, to finally expose the cluster management cycle theory and the definition of cluster team working. The key element of remote project management is that the project is coordinated from outside: a different city, country, etc. Moreover, one of the consequences is that the team is geographically dispersed. As NGOs, some companies have also scattered crews all over the world working on the same project. Thereby, the same challenge must be overcome. The key challenge for international NGOs is to deal with geographically dispersed teams and all the consequences. They would prefer to be on the field for a more effective action but due to insecurity reasons they have to oversee the activities from another location. Thereby they want to pursue a humanitarian imperative principle : getting aid to those in need as the first priority-even if it must be done from a distance. Usual companies are practicing remote project more for offshore outsourcing and develop new markets. But this lead to the same coordination problem inside the company. This kind of management has several negative sides as risk transfer on local team or poor quality and coordination. But those are due to a short-term decision-making attitude. The cluster approach that will be explained later resolves some of these drawbacks and can be applied to common companies. As it can be seen on figure 2, the two main difficulties are to communicate effectively and trust. As local NGOs should have trust in their international management, dispersed teams should have the same behavior with the Head Office of the company. It enforces the formation of cohesiveness between team members. If there is not enough confidence between the teams, they will have some difficulties to face challenges and even sometimes blame each other. Moreover, the local workers have a better understanding of the problem but international headquarters have knowledge from different and previous experiences. Therefore, scattered teams should appreciate the skills of everyone and use them with trust. An example will be taken in order to illustrate this challenge. An American NGO operating in Afghanistan with a local supplier will have some issues with the communication. Indeed, there is a difference in time zones, in languages and a cultural difference. The change in time zones imposes some delays for the response. But in emergency situation this delay is not acceptable. Therefore, there is a significant demand for staff to cover the time difference. Then, the language is also an important barrier. First, which language to use. Then, have all team members sufficient knowledge to communicate properly? There could be some misunderstandings that can impede the progression and implementation of the emergency response. That is why the remote control should be implemented early and taking into account all these considerations. The same likenesses are existing when firms practice 'remote management': how to be sure that the requirements and responsibilities are well understood between all the project members? First, an easy solution to resolve the different in time zones could be using low bandwidth communication channels, such as emails or documents, which generates large amounts of lost or misunderstood information. Therefore, video and desktop sharing should be used instead to promote face-to-face communication. Then, employees from different countries use diverse technologies. Americans would probably prefer Microsoft Office and the Chinese more open-source software for example. When the team are in the same building, those problems will be generally resolved by face-to-face communication but for remote project it will be impossible. Therefore, a clear definition of which programs should be used must be done before starting the remote project. Even if this approach is still to be improved, notable benefits have been identified in different fields like gap identification, coordination or information sharing. Thanks to an improved collaboration between the agencies, it was possible to reduce the humanitarian efforts on site. Indeed, each of the members rely on each other. Moreover, it was possible to identify the missing services inside the cluster and correct it. . Indeed, the cluster approach allows to have a collective response to a specific problem. The information will be shared in a better way. By this means, the origin of gaps and overlaps can be identified earlier. This binary managing structure with on one side the Cluster lead (UN for example) and on the other side the cluster agencies (WHO - World Health organization for instance) responsible for one sector, allows to clearly understand the responsibilities of one and all. These sector agencies are in charge of ensuring response capacity in place and that assessment, planning and response activities are carried out in collaboration with partners and in accordance with agreed standards and guidelines . What make the cluster approach working is the fact that all the team members are working for the same common humanitarian objectives . The leadership of the coordination is held by the Cluster lead and the leadership on the sector is held by the agencies. For project managers, thanks to this structure each needs in the project are identified and related to someone. If there is a new specific need it should be a new responsible. It ensures consistency in the structure. In that way, it becomes easier to manage and identify the weaknesses. Moreover, the leadership is clearly defined. Before the implementation of cluster approach in the humanitarian response, each member collected information but the data was not shared between the agencies. No one may learn from the other experiences and there was no database. Trough cluster they can now share valuable information, analysis, strategic planning and evaluation. Thereby this system improves the understanding of a pressing issue and it is easier to find an appropriate response. Working processes have been identified and can be so easily implemented. Monitoring and information sharing are key elements to ensure an upright remote project for a company. As it will be seen further with the cluster project management cycle, this monitoring activities and evaluation are the core process of this model. The cluster Management Cycle is a way to implement the cluster approach in aid projects but it can be also applied in conventional firms who are dealing with international partners or teams. Cluster management is defined as a perpetual cyclic activity. It’s a complex, interactive and non-linear process. . There is so a requirement in an adaptive management structure. As explained on figure 3 six stages are essential to establish this cycle. In order to have well-defined objective, the first step is to outline the expected results for the cluster. A clear vision of the long term future of the cluster should be defined. It represents the strategic planning. For example, the WHO (World Health Organisation) cluster defines its vision as promoting health in the world. Another important recommendation is to identifying key uncertainties. As in insecure environments, the cluster manager is working in a highly uncertain environment and should act despite unpredictability. In order to succeed in cluster management, the vision and strategy should be developed with all clusters members. Moreover, the goals even in emergency situation should be measurable and feasible. Then, each clusters member should recognise what are the benefit of this type of coordination. After defining objectives, they have to be performed. As seen before, one key challenge is to maintain a clear communication between the different stakeholders. Because of the change in technologies and languages, it can become a hard task to manage. Therefore, two different plans should be presented. First, an action plan has to be implemented in order to highlight the activities, the related responsibilities, planning and allocation of the resources . For each objective there has to be indicators for success and measurement. Thereby, a data collection could be performed afterwards. However, those indicators should be well chosen in order to avoid an overload of information. Then, a communication plan should be defined in order to promote a positive association, behavior between the members. Several questions should be answered in this plan like “Who are the Stakeholders?” "What are the communication mechanisms", etc. As in emergency situation is important to maintain a regular contact with the local suppliers. The frequency will differ following the role of the cluster member in the crisis as in the project for the companies. However, the communication mechanisms (software, etc.) have to be clearly characterized with all the stakeholders. Finally, all the cluster members should accept a governance agreement for the decision making and communication. Once the design approved, the implementation has to start. Here also similarities could be understood between the operational actions of NGOs and companies: the networking, providing information, collaboration, training, etc. . The networking activities could be done during workshops or international conferences. The most important step in the implementation is to promote collaboration between the members. If they don't have the goodwill to work together the cluster structure will collapse. However, to have a proper collaboration, it has been shown that some of the key challenge should be mastered. For instance, the technical issue can be resolved by providing training in some softwares. Monitoring is extremely important to gather crucial information on the different projects. To have useful data the participants must know which kind of info should be collected, their form and the involved people. Furthermore, it should be done on a systematic way and on a regular basis to have a good monitoring. There are two ways for monitoring the actions: the first option is on a process-related indicator (that should be defined in step 1- Define), the second one is a continuously collecting of information on the outputs. However, this last method requires a big involvement of the cluster member to share uninterruptedly their information. For emergency case, it could be very interesting but in other case it could impede the correct working of the group. The goal of monitoring is to adapt and check if the cluster is acting in the right way. Moreover, it allows to identify problems in planning and/or implementation. The correction should be implemented as soon as possible. Comparing the actual effects with the decided strategies at a define moment is called evaluation. It differs from monitoring in the way is done. Monitoring is continuous and evaluation is at a precise moment (generally once or twice a year). Moreover, the evaluation report shows if the objectives were reached, the strengths and weaknesses of the cluster. It allows a complete understanding of the cluster organisation. Usually, if there is a correct monitoring, the evaluation should be right as well. Two types of evaluation could be highlighted: the formative and the summative. They form together the complete evaluation. The purpose is to analyse the organisation of the cluster. The goal is to look at the improvement of the development of the cluster and its local impact. Then, another purpose of the evaluations is for decision policy. The assessments are a way to justify certain decisions like in difficult contexts (emergency disaster, bad economic context…). Finally, it is extremely important for the experience and the development afterwards. Lessons could be learned and the action plan established in step 2 could be changed. The final step of this cyclic process is to review objectives and uncertainties taking into account the previous stages. After that the lessons learned and results must be spread with the stakeholders or in the company. At this stage, some reports about the different evaluations have to be produced and shared to a wider community. This last step closes the cluster management cycle. Custom-made plan: operational objectives and schedule. It represents the purpose. Defined time-frame: when there is a need, the cluster is used. Once the objectives reached, the cluster has no reason to stay. Evolving team members: If new skills are required, new members will enter in the cluster. Self-organized: Clusters have their own structure and rules. They received the remuneration as a unit and spread it between the participants. For a project manager, clusters have the benefit that they have defined with the company a clear outcome and work for this unique result. It ensures a high motivation of the members to achieve the same goal. Therefore, the project should be divided in results to achieve. In that way, the project becomes easier to monitor and evaluate. That’s why the cluster management cycle has to be implemented early in the project. However, this group of talent people can lead to some issues with the coordination. Indeed, it’s important to avoid the Apollo effect  where each member want to impose his solution. The lead manager should clearly express the responsibilities of everyone and avoid that a fellow impedes the progress of another one. For the manager, the cluster model removes individual performance management where the faithfulness of the talent members to the company is tough to achieve. Yet, the issue is to guarantee that the best are motivated to stay, the worst are inclined to go, and those in the middle are motivated to improve. . The role of the lead project manager is to preserve this motivation through the members and one way to do it is to apply correctly the cluster management cycle. Indeed, with this tool, the manager can easily show by evaluations that the cluster is working well towards the common objective. Like any system, it needs to be improved. With the cluster management cycle, the feedback is made automatically. The video bellows that shows the main future enhancements required for the NGOs. 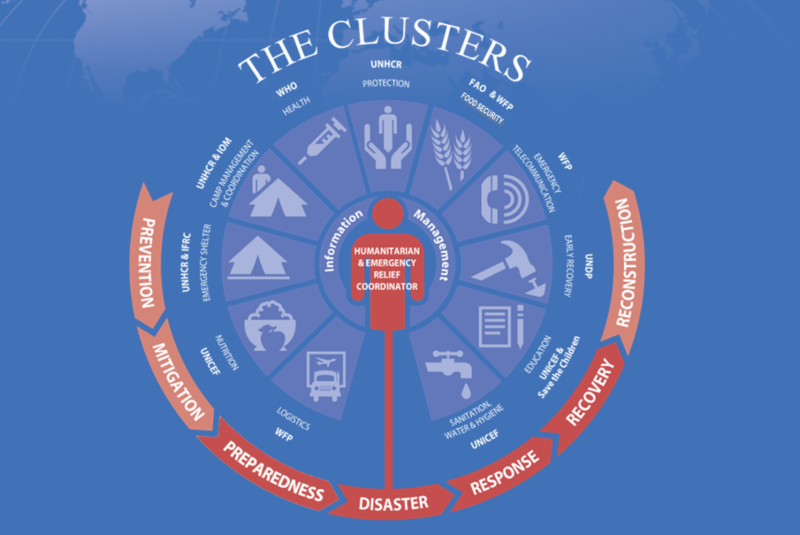 For more information about remote project and the cluster approach in humanitarian operations. A. Stoddard, A. Harmer, and J. Renouf, Once Removed: Lessons and Challenged in remote management of humanitarian operations for insecure areas, 2010, Humanitarian Outcomes. This article explained that organisations doing remote project can avoid the drawbacks (risk transfer, effectiveness, etc.) by a cluster approach. It explains the different challenges and types of remote projects. It explains also more in details the definition of insecure areas and why the current NGOs use remote management. It describes the current methodologies to ensures the humanitarian response. This report from PWC gives an overlook about the cluster management cycle and details deeply the six different steps. It clarifies also the cluster governance that was not exposed in this article. It is more based on knowledge-intensive clusters between companies, universities and authorities. There is less information about remote project. It enlightens about the fact that with an appropriate team working (i.e. clusters) the companies could be more innovative. It says what is the definition of a cluster as a unit of a companies, how it is work and the benefits/drawbacks of this kind of project management. The author emphasizes the fact that the current team working is not the proper way to be innovative. This white paper was used more to highlight the challenges in distributed teams but it explains a lot about distributed Agile management that is not covered in this article. Nevertheless, it could be interesting if the reader wants more information about remote project without the cluster approach. It explains the best practices in this kind of team working and if it is successful to have distributed teams. This page was last modified on 18 December 2018, at 16:00.